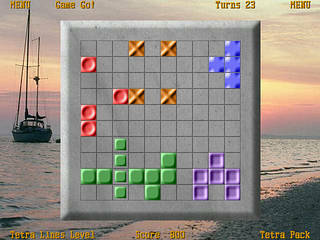 Tetra Pack - Five new Tetris games with original ideas! New Tetris games with original ideas you will not be able to find anywhere else! Overview: Prevent the board from filling up completely by arrangement pieces into a cluster of Lines, Blocks or Polyomino of the same color. Such cluster disappear, increasing your score and freeing the board. Full version features: Unlimited games play. Play in 10 different games levels. Undo and Redo up to 80 turns of games. Save your games to start where you left off. Customize the background and gameboards design. Amazing full screen graphics. Record your 120 top scores.